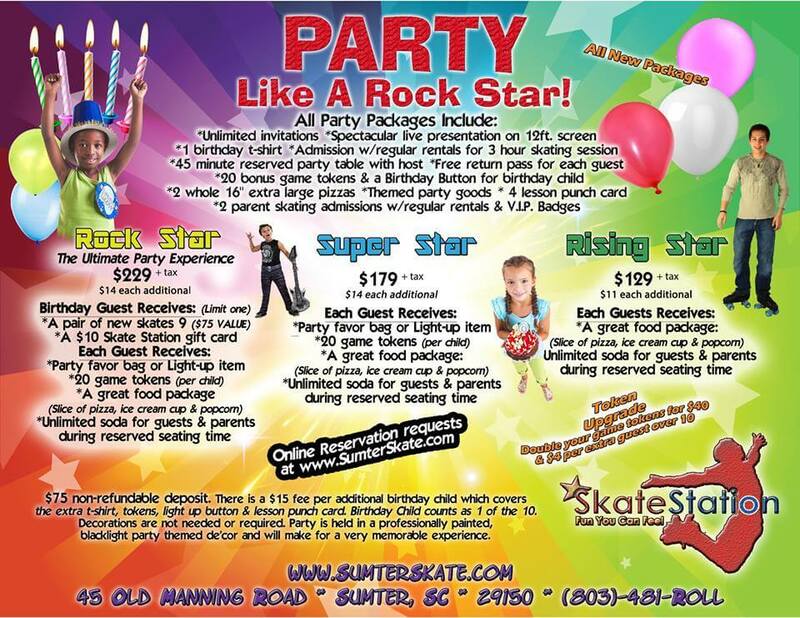 At Skate Station, we’re committed to bringing you the best events in Sumter all year long. We don’t need a special occasion to have a good time, we make our own! We have events to cater to all interests, ages and families. 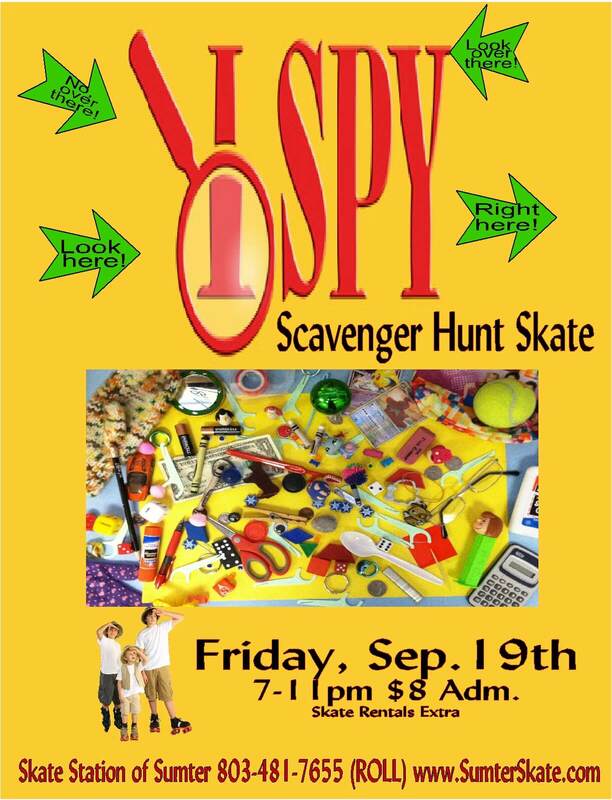 This Friday, September 19th, is the ISpy Scavenger Hunt Skate! Be sure to be there with all of your friends and be ready to have an awesome time! 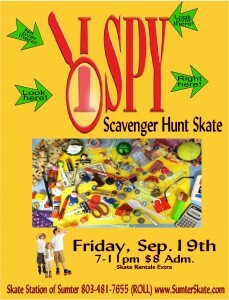 Admission is $8 and we’ll be on the hunt from 7 to 11 pm! Saturday September 20th we’ll be having another Candy Scramble around 2:45. Admission is $6. What’s better than skating and free candy? Saturday September 26th is the Face Paint skate. 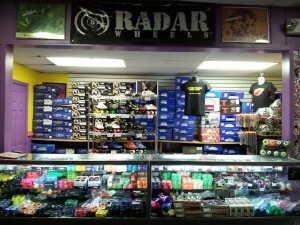 Come with your favorite face on and be ready to roll. 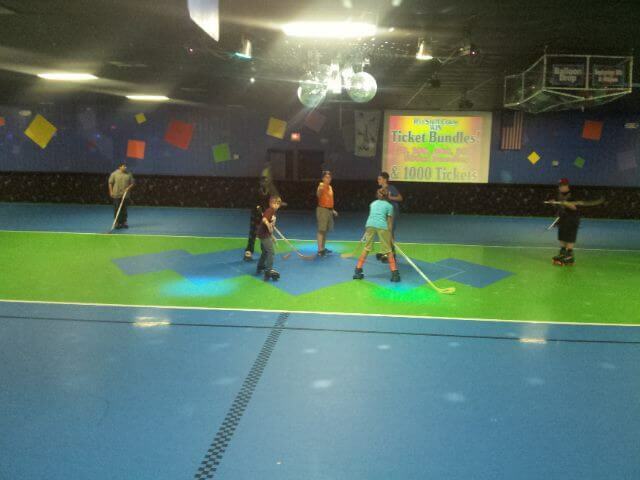 Admission is $8 and we’ll be skating from 7 to 11pm. As we get ready to head into October we have a ton of events ahead. Like to get your schedule in advance? We’ll be on the lookout for our Pink Swing Lock In on October 3rd and a Balloon Drop on October 11th! There’s a free prize in every balloon! 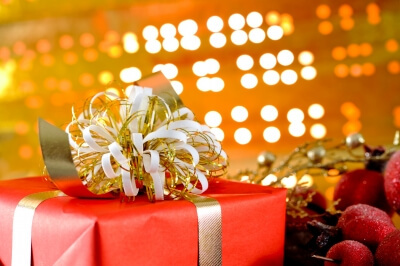 For more information about our events, private events or birthday parties be sure to check our website regularly! 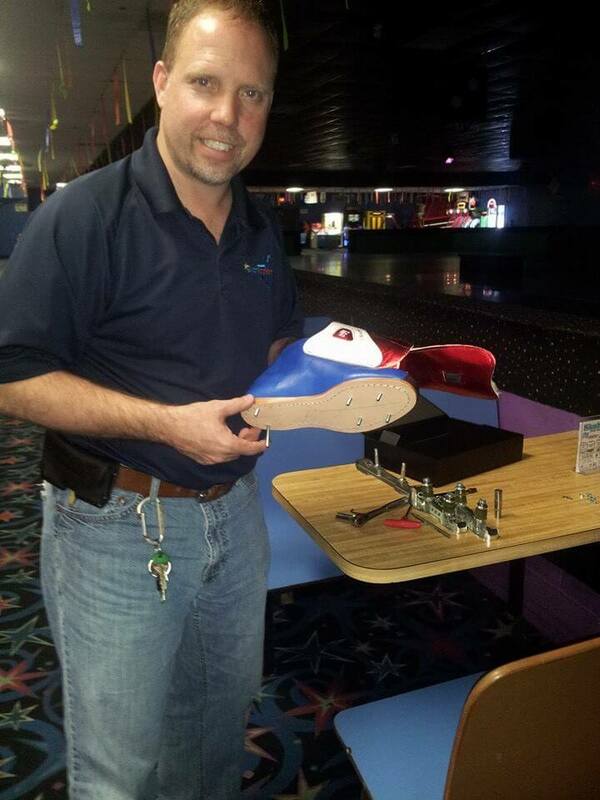 You can also follow us on Facebook, Twitter and Google+ for even more updates and events at Skate Station! Have questions? We have answers! Please feel free to contact us here. 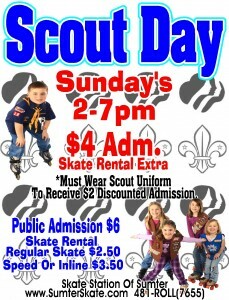 Every Sunday is Scout Day at Skate Station! Every Sunday at Skate Station, we acknowledge the boys and girls who are out there volunteering and working to make a difference in their communities. 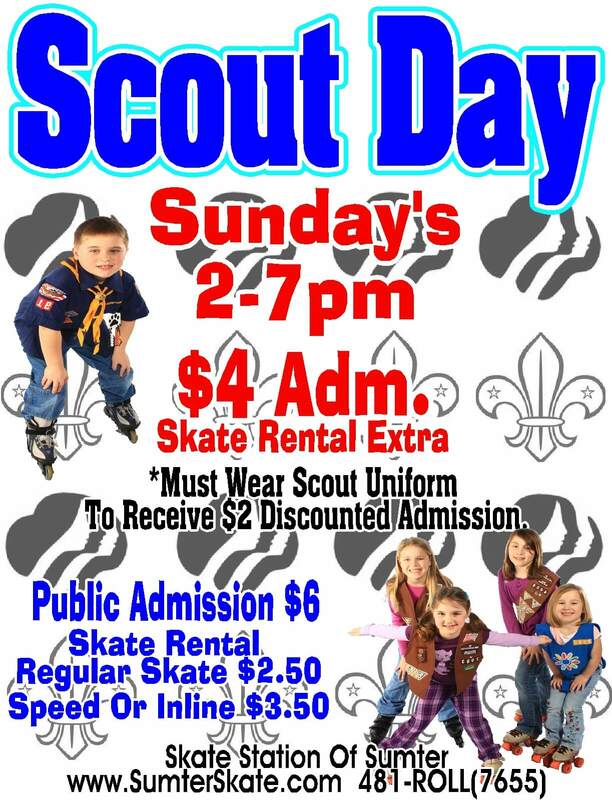 Each Sunday, if scouts (both boys and girls) come to Skate Station in uniform they will receive $2 off regular admission! It’s not only a great opportunity for kids, it’s great for parents too. Both organizations have many opportunities for parents to get involved, volunteer and even help their kids on their projects and community service initiatives. Not a scout? No problem! We have ongoing specials in addition to our events each week! For more information on what’s going on at Skate Station, check out our schedule here. At Skate Station in Sumter, we want to thank these boys and girls for all of the hard work they do to help better our community. We’ll see you next Sunday! Roller skating gets kids off of the tech tools! With video games and smartphones in their hands, it’s tough to get them to be social in a face-to-face setting. They won’t even be thinking about their phones once they set foot on the rink. It’s physical! An hour of roller skating can burn as many calories as an hour of running. 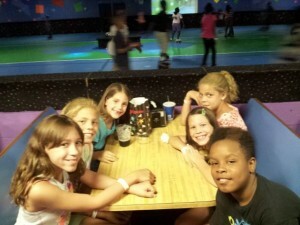 Not to mention the great music and companionship will have them having fun on the rink. It won’t ever feel like a workout, especially when we have our regularly scheduled events! 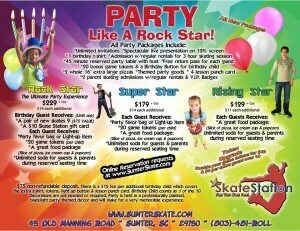 Kids Skate Free! 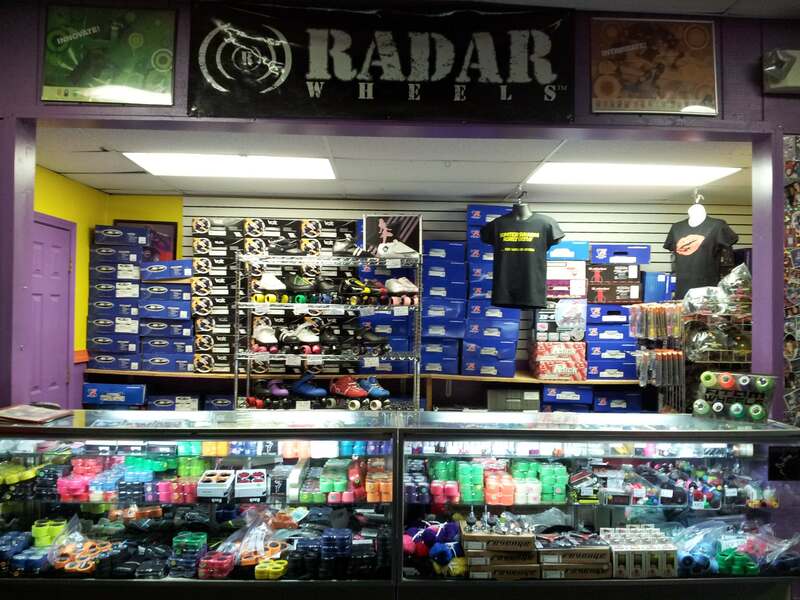 We accept the Kids Skate Free passes out our location during the preset scheduled times, just pay extra for your skate rental. At Skate Station, we are committed to helping kids find their passion and gain confidence on their own two feet (plus skates, of course)! 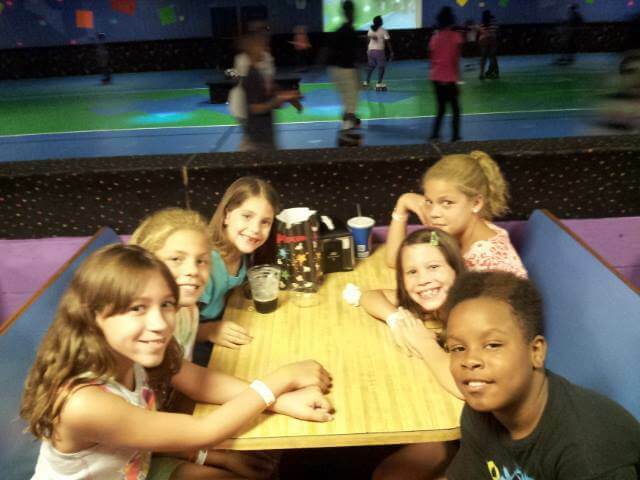 For more information about roller skating sessions for kids in Sumter, check out our events page or contact us here.